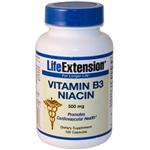 Caution: Do not take more than 500 mg of niacin per day except under supervision of a physician. Temporary flushing, itching, rash or gastric disturbances may occur. If these symptoms persist, discontinue use and consult a physician. Periodic liver function testing and supervision of a qualified healthcare professional are strongly recommended with niacin dosing in excess of 500 mg daily.